(NaturalNews) Marine biologists and other researchers are voicing serious concerns regarding the high mortality rate among orcas (killer whales) observed over the past couple of years. No one has yet proven that there is a direct link between the 100 percent mortality rate seen among orca infants and the effects of the radiation contamination of the Pacific Ocean from the Fukushima reactor leak in Japan, but it certainly can’t be ruled out as a possibility. It is rather interesting that the incidence of orca deaths — not just of infants, but full-grown specimens as well — has risen sharply since the accident occurred in 2011 and as the radiation has made its way across the Pacific Ocean to the West Coast of North America. Scientists have also noticed odd behavior among orcas recently. Dr. Lance Barrett-Lennard, senior marine mammal scientist at the Vancouver Aquarium, has been “sounding the alarm” over the unprecedented mortality rate and the changes in behavior seen in orca pods off the coast of Canada and Alaska. They weren’t vocalizing, and that was quite a striking change after years and years of being very familiar with how noisy they are and how easy to find acoustically. He believes that “something is likely wrong with the ocean environment,” as paraphrased by News1130.com, and that more research is needed to understand the reasons behind the high death rates and the behavioral changes recently observed by the scientists. 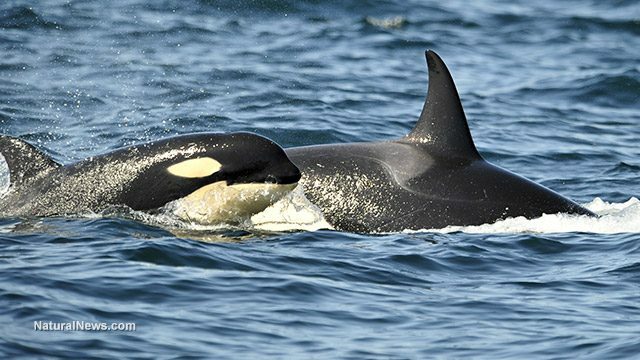 Aside from the 100 percent mortality rate among orca infants, many of the matriarchs are dying as well, leading some to speculate that the species may become extinct — possibly within the next 20 years. The recent discovery of a carcass off the coast of British Columbia — that of a 19-year-old orca female, which was believed to be in the late stages of pregnancy, is just one example of the recent orca deaths that have scientists and conservationists worried. Her death doesn’t bode well for the southern resident population and certainly not for that matriline. Her mother died young. Her aunt had two sons and she’s probably post-reproductive. She hasn’t had any babies in the last 12 years. So there’s no future. We haven’t had any survivals in babies for a couple of years. We have had stillborns and newborns die and a number of whales that appear to be pregnant but didn’t ultimately produce any calves. It’s like zero survival in birth rate here. Our hopes are just so fragile already. There was a calf born in early September that lived less than a month and that was the first calf in two years. The last calf that survived was August 2012. There should be two or three births at least per year just to hold steady. We like to see four or five per year. Instead, there have been seven mortalities and no births. READ 1928: Who Lived in America 50,000 Years Ago? As mentioned above, there is no proven link between the Fukushima radiation leak and the high mortality rate among West Coast orcas, and many other sea animals, as of yet, and more research is needed to determine exactly what is killing the killer whales. And at this point, radiation poisoning can certainly not be ruled out.